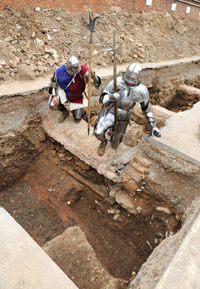 Historians, archaeologists and the public are still waiting to see if the skeleton discovered last month belong to King Richard III, but the discovery may never have been possible if a Victorian building was built just a few inches closer to the long-forgotten burial spot. The University of Leicester led the search for the 15th century English monarch who died at the battle of Bosworth in association with Leicester City Council and the Richard III Society. The University team dug three trenches under a Leicester car park before their discovery was made. Now site director Mathew Morris has disclosed that the remains were found just inches below Victorian foundations. Had the 19th century builders dug a little further-no remains would have been found. A team from the University of Leicester, including archaeologists and geneticists, is now engaged in a scientific investigation to determine whether the remains are indeed of King Richard III. Using DNA extracted from Michael Ibsen, believed to be a descendant of King Richard III’s sister, the team will seek to determine if there is a match. Results are expected within a few weeks.